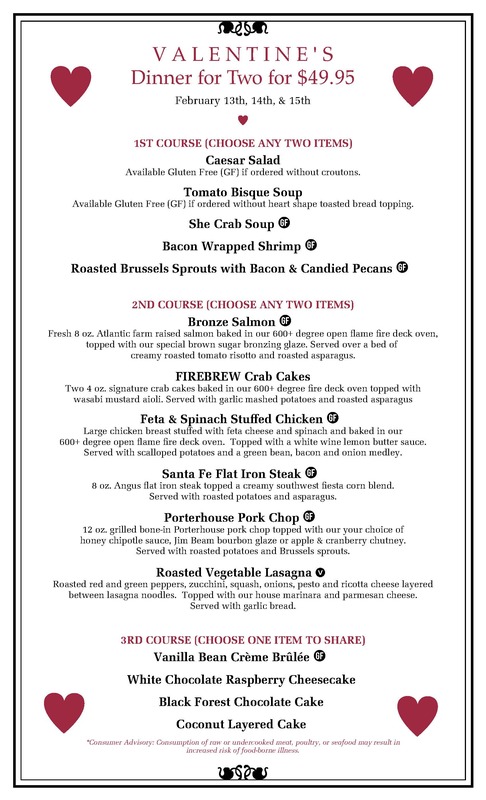 Treat your sweetie to an incredible meal at FIREBREW Bar & Grill. With the combination of our open kitchen, the option to fill your own wine glass, and this Dinner For Two Valentine’s special, we know exactly how to make this an unforgettable Valentine’s Day. Come spend a night of romance with us at FIREBREW! NOTE: WE ARE NO LONGER ACCEPTING RESERVATIONS FOR WED-FRI (2/13 thru 2/15). We will have several tables still available on a first come first served basis on each of these days. Call ahead seating will not be available on these days due to the high volume of reservations and expected walk-ins. Note: Our regular menu will also be available in addition to our Valentine’s Specials.